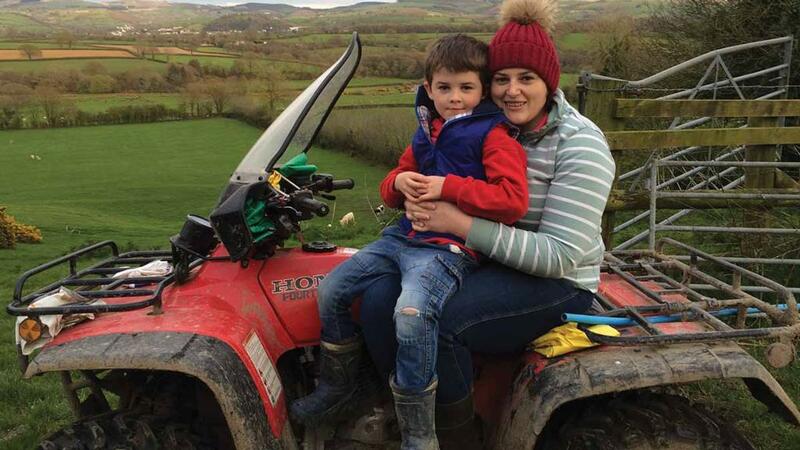 Helen Howells, 32, farms with her husband Peter on an 89 ha (220 acre) family-run beef and sheep unit specialising in breeding pedigree livestock under the Gwenog and Pedr prefi xes. She also runs her own consultancy from the farm, Hwylus, which provides values-based consultancy to the rural sector. Sheep: We finished lambing over six weeks ago so our attention has turned to managing the soil and grassland. Contractors applied a dressing of slurry recently and we have been moving the youngstock around different pastures, getting ready to turn the cattle out. I had the fun job of vaccinating the lambs against orf; a messy job but it was great to have a thorough look at this year’s crop of Texels. We are really pleased with the new stock ram we bought last autumn, he has thrown some decent lambs for us. It has also been great to see our customers sharing pictures of their lambs on Facebook. We sold our first draft of Texel tups at the NSA main ram sale at Builth last autumn, reaching a top price of 880gns. We measure our success on the impact our stock has on our customers’ businesses – this next year is about increasing our profile, capitalising on 40 years’ experience of terminal sire breeding and making sure customers know they can come to us for sound Texel tups, focusing on conformation, correctness and character. Repeat custom and referrals are key for us and we are proud to stand behind our Charolais bulls and Texel rams. Political uncertainty: Theresa May’s announcement for a General Election in June brings yet more uncertainty for the industry, along with Brexit. As livestock farmers in west Wales, our profitability is closely related to the value of the export market and further volatility on this front makes forward planning difficult. Our focus for the next five to 10 years is growth and maximising returns through efficiency, but political uncertainty and trade makes it harder to make sound investment choices. They say fortune favours the bold and investing in land seems a safe bet but, talks of falling agricultural land prices, amid no sign of a trade deal for red meat, puts young farmers in a vulnerable position. ‘It is OK to say’: ‘The stiff upper lip’ is synonymous with the rural farming community. Most of us just get on with things, often hiding problems from ourselves and talking about our feelings is alien and uncomfortable. We have faced some pretty lowpoints as a community in the last few years – TB, price volatility and NVZ proposals – which all puts a strain on our resolve.